No more mushy, hard, or burnt rice! Try this easy fail-proof method to make the perfect Pressure Cooker Rice (Instant Pot Rice). Fragrant and fluffy white rice ready in just 15 minutes. YES please! Rice is such an important food in Asian cultures that it has really become a part of our cultural identity. My dad often jokes that his life is not complete if he goes a whole day without rice. Ha! That’s why you’ll probably find at least one rice cooker in every Chinese home. When we first got married, we bought a decent Japanese rice cooker for ~$150. We’re quite satisfied with how consistent it is in making fragrant and great tasting rice. So, we were quite skeptical if the quality of the Instant Pot Rice (Pressure Cooker Rice) can match those from our rice cooker. The best thing about cooking rice with a pressure cooker is that it’s FAST! The Instant Pot Rice (Pressure Cooker Rice) is done in 15 minutes, ~30 minutes faster than our rice cooker. If you’re going to use an electric pressure cooker, you’ll love how you don’t need to wait for the water to boil, tend the pot, or stir the rice like you would cooking it in a regular pot. Just set it and come back to perfect pressure cook rice. Too watery: this means your rice is under-cooked. Rinse rice under cold water by gently scrubbing the rice with your fingertips in a circling motion. Pour out the milky water, and continue to rinse until the water is clear. Drain well. *Pro Tip: Don’t skip this step as it helps get rid of excess starches on the surface and prevents the rice in becoming gluey. Add rice and water in the pressure cooker. *Pro Tip: Be sure to cook the rice immediately after you pour the water in the Instant Pot – this prevents throwing off the water:rice ratio. 1. Double the Recipe: If you want to cook more rice, double/triple the amount using the 1:1 rice:water ratio with the same cooking time. 2. Rice Storage: store white rice in a sealed container in a dry and dark place. 3. 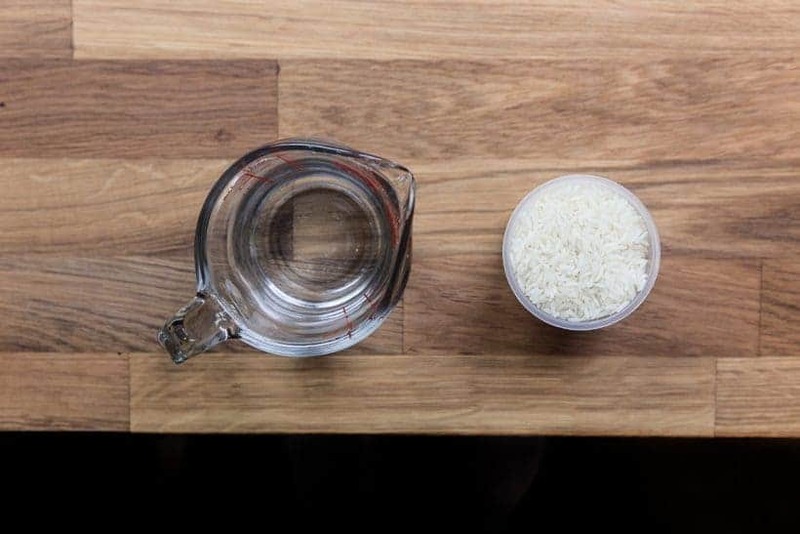 Rinse the Rice: It’s important to rinse the white rice under cold water until the water is clear. This will get rid of excess starches on the surface and prevent the rice in becoming gluey. 4. Cook the Rice Immediately: Cook the rice as soon as you pour the water into the pressure cooker. 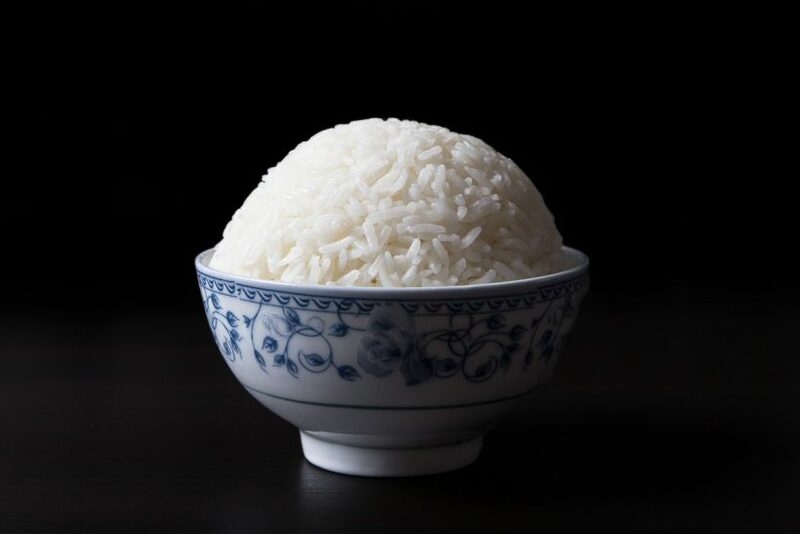 If you let the rice sit in the water, the rice will continue to absorb the water, which will throw off the ratio. 5. If the rice turns out a bit wet when you open the lid, first fluff the rice with a fork to let the moisture escape through the steam. Then let it rest a bit before serving it. Now it’s YOUR turn to take out your pressure cooker and cook some Perfect Pressure Cooker Rice (Instant Pot Rice)! No more mushy, hard or burnt rice! Try this easy fail-proof method to make perfect pressure cooker rice (Instant Pot Rice). Fragrant and fluffy white rice ready in 15 minutes. Rinse Rice: Rinse rice under cold water by gently scrubbing the rice with your fingertips in a circling motion. Pour out the milky water, and continue to rinse until water is clear. Drain well. Pressure Cook Rice: Add rice and water to Instant Pot Pressure Cooker. Close the lid. Cook at High Pressure for 3 minutes, then Natural Release for 10 minutes. Release remaining pressure, then open the lid quickly. Optional Seasoning: Add salt to the rice for seasoning. Fluff & Serve: Fluff with a fork and serve warm. If you use the rice measuring cup that came with the Instant Pot Pressure Cooker to measure the rice, remember to use the same measuring cup to measure the water as 1 rice measuring cup = 180 ml of rice. Hi Amy & Jacky, I haven’t tried making rice, yet, but need to for a dinner. I want to make 3 1/2 cups of cooked rice but I need some clarification about the 1:1 portion. Will I end up with 2 cups of cooked rice or just 1 cup of cooked rice using the 1:1 portion? If I increase the amount how much added time could this take. For instance: 1 1/4: 1 1/4 ratio. In general, one cup of rice will yield 2.5 – 3 cups of cooked rice. The cooking time will stay the same. I’d like to scale the recipe up to 2 cups, will the cooking time be twice as long in this case? Also, any tips of cooking time if I were to mix in 2/3 cups of glutinous rice with the 2 cups of jasmine rice and cook it together? The cooking time will be the same for 2 cups. I recommend cooking the glutinous rice separately as they require different cooking time and water ratio. Eeeeasy👍🏻 Just made this and it came out perfect! Can’t wait to try some other recipes here! I’ve used this receipe many times and it always turns out perfect but I do not always like having to clean the large inner pot for this recipe. How would you cook it in the instant pot using an oven safe bowl or even using the pot in pot method? Curious minds want to know! We have just published a pot in pot rice recipe here. Glad you’ve enjoyed cooking rice in Instant Pot! Trying the IP to see if it can replace our old Zojirushi neuro-fuzzy rice cooker. But, it’s not turning out quite as loose and fluffy. Just curious if you’ve tested other setting combinations (high vs low pressure, different pressure vs release times, etc) and when time’s not a factor (I’m used to waiting 45 minutes for the Zojirushi) if there’s an optimal method? We have found high pressure works better than low pressure. Is the rice you are making too wet? Thank you Amy and Jacky for this fast and easy recipe for rice! it was delicious and the rinsing of the rice made a big difference. It was the best rice ever!!! I’m a Filipina living with a white man. So rice isn’t ALWAYS made in our house. This recipe is great for us. I can scale it up when I need to and it always tastes amazing. Thank you for this recipe! You did a wonderful job of covering all the bases. Show me recipes don’t mention rinsing the rice to remove the excess starch and she use the high pressure setting which ultimately save time. Subscribing 🙂. Cheers from Austin Texas! I’m sure this has already been asked – how would the rice change if I just left it on keep warm after the 3 minutes? (Versus doing only 10 minutes of natural release). I’m debating on getting rid of my rice cooker but I like the “press it and forget about it option” with the rice cooker. I don’t want to have to “remember” at 10 minutes on the IP to release leftover pressure. Made this twice this week. First time we just did 1 cup of long grain white rice and it came out perfect. Last night, we doubled the recipe and again, absolutely perfect fluffy rice. We will never make rice on the stove top again. Thank you! Hello I am going to try my new instant pot and making rice for a crowd of 25. Do I keep the 1:1 and what about the cooking time? Do you cook the rice directly in the Instant Pot pot or a separate bowl/smaller pot? If using a smaller pot, do I put the smaller pot on a steamer rack? Also, do I need to put water in the Instant Pot pot, and how much? For this recipe, you can cook the rice directly in the Instant Pot. You can also cook the rice (with water) in a separate smaller bowl on a trivet as well. You will need to place 1 cup of water in the Instant Pot and increase the cooking time by 2 minutes. Hi, I cooked jasmine rice yesterday with 2 cups rice and 2 cups water and it came out perfect! Today I increased it to 3 & 3 and the burn message came on. Any advice? I would recommend rinsing the rice first to remove some of the starch. I have a spt e-13 pressure cooker. This is my first and I have no clue what I am doing. Mine says 8 minutes for rice when I hit the rice button. Then I have to wait for the pressure to release. This seems different than what you are taliking about. Not sure if this pertains to my cooker or where I find recipes and ideas that will work with mine if yours does not. I like the idea of using chicken stock and doing other things, but I do not see a manual button or anything like that. For our recipes that states High Pressure, you will want to use the highest pressure setting on your pressure cooker. I would follow the cooking time & steps in this recipe using the highest pressure setting. I’m trying this tonight and will use the 1:1 ratio with rinsed rice for 3 min. My question is: your Basmati rice recipe is perfect using your #5 test which is no rinse and 6 min. My daughter made your Teriyaki chicken with Jasmin (not rinsed) and cooked for 6 min. She said it came out perfect. Since they are both long grain, why is one cooked for 6 min and one for 3? Is it a typo? Jasmine rice takes a shorter time to cook than Basmati rice. Rice will not overcook easily so cooking the Jasmine rice for 6 minutes will be fine as well. I have a EPC XL, wondering if I can make these recipes in it. These recipes will work in the EPC XL. Can you help with a recipe for short grained rice, say for sushi? Tomato sauce is quite easy to burn if it is too thick and the chicken will also add to the get up to pressure time. Here is an article on how to avoid the burn error. Perfect as always! Thanks for making it so easy. My rice sat for about 40 minutes on off with the lid off but set on top gently and it stayed warm and got only slightly sticky. Do we need to turn off the pot first before we are doing the natural release. Both ways will work fine as the keep warm function will not kick in well after natural release. Thank goodness for this recipe. I tried following the quick start chart that came with my pressure cooker and the rice didn’t come out st all. Your directions yielded perfectly cooked rice! Thank you! Happy to hear the result!! Is the cooking time 3 or 6 minutes. In your recipe says 3 minutes but on the video, the timer is set up for 6. There were a lot of great tips here! Thank you! As a new Insta Pot recipient, I was glad to run onto this. Let us know if you come across any questions! Hi I bought an electric pressure cooker and I tried the one to one ratio. The rice came out good but there were a few burnt spots on the bottom. What do you think could have happened and how can I do it better next time? I would recommend rinsing the rice first the remove some of the starch. Hello. I currently have Nishiki rice. I tried using the Calrose rice method with it but it came out a little too wet. Any advice with the ratios? 🙂 thanks in advance. We are still working on Nishiki rice. Hopefully we can have it done soon. Do you recommend this much rice at one time. I tried 2 cups at 22 min and it was perfect but I want to double it. 4 cups of Basmati brown rice will work fine. When doubling rice, you can keep the same ratio and the cooking time. As a senior citizen with a wife that still travels a lot I am left to fend for myself at meal time. I received an Instant Pot for Christmas and was especially thrilled to see that it cooks rice well. Yesterday was my first time to use the new gift. One cup of water and one cup of Jasmine rice were placed in the inner pot and I then closed the lid and insured that the vent was at sealed and pushed the rice button. After the cook cycle was over it went into Lo and then counted off ten minutes during which time the pressure release function did its thing. I opened the lid and removed the rice and fluffed with a fork. Voila, perfect rice which served my well for to meals with orange chicken. Thank you for your help. If I was just cooking long grain white rice, would I follow these same instructions? Jasmine rice is different than regular white rice, correct? 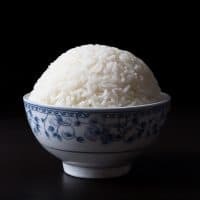 I am just recently discovering there are so many different kinds of rice, and I am just used to common ¨white rice¨, but I am learning that there is more than one kind that is white! 🙂 Thanks!! Jasmine rice is a type of long grain white rice so you can most likely follow the same instruction. Hi! I tried to make white rice using the rice setting but it comes out too hard and not good at all. I want to try your way next. Is the rice button ever useful or should I just stick to the manual way? thank you for your question. The rice button uses low pressure so I would stick with the manual way. Merry Christmas & Happy New Year to you and your family! How do I cook? Minute? Don’t understand the cooking , button and release button part? The measuring cup provided is only a rice measuring cup. You don’t have to use it. You will want to use 1:1 chicken stock to rice ratio. Use the Saute button to saute the pepper first then press cancel and press the pressure cook or manual button. Use the Pressure Cook or Manual button and cook for 3 minutes then let it Natural release. Hi.. I just found your website for recipes. I’m new to the Instant Pot. Looking at your recipe for rice (Jasmine).. it looks right.. but, I have a question about your doubling, tripling, etc. Do you really continue to use a 1:1 ratio for multiples? One more question. Do you use any oil in your rice recipe? I have used a bit of butter the first time I tried in the IP. I’m wondering about adding a tsp of sesame oil. Thoughts..? Glad to have you on our site. Yes, we have tested it to 4 cups and 1:1 ratio will work fine. I just got the IP DUO PLUS and I’m trying to perfect cooking the rice. What’s the difference between using the high pressure to cook it and the “Rice” function? Would they come out the same? Do you need to do the 10 min NPR for both? Can I leave the rice after cooking without the NPR and let it keep warm? Thanks! I really like your site and recipes! More power! The rice function uses low pressure so the rice will come out differently and will require different water ratio. Natural pressure release will be needed for both of them. Leaving rice under keep warm is quite tricky as they do get sticky after awhile. I would recommend getting a non-stick inner pot if you want to keep warm for a longer time! How would you recommend keeping cooked rice warm and best for serving over a long period of time, say for at a party where people will serve themselves? I’m interested in trying this method- thank you for sharing. Rice gets quite sticky after keeping warm for a while. I would recommend getting a non-stick liner for the Instant Pot to keep the rice from sticking. Please tell me what I’m doing wrong… I have failed EVERY SINGLE TIME I’ve tried rice. Tonight I tried Jasmine rice with this exact recipe. It never sealed. My rice was cooked but totally scorched and stuck to the bottom of the pot. Happens every time. thank you for your question and I am sorry to hear what happened. Is the venting knob turned to the sealing position? Make sure the silicone ring is seated correctly as well. If you are a visual learner, you may want to head over to our cooking video section and see the whole process. Thank you turned out perfectly. I have never tried making any rice other than instant white rice, this was so much better. I always thought that rice was rice. I think your recipe might have just started a new adventure into the world of rice! So happy we can be a little part of your new adventure into the world of rice!! Hello. I usually cook my rice in a programmable rice cooker since it makes perfect rice with little effort. I wanted to try the instant pot recipe to see if it can help when I’m short on time. I followed everything mentioned here and the Jasmine rice was fully cooked but definitely firmer and more chewy than I’m used to, not fluffy (i almost think I’d call it “al dente”). It was just sightly wet, but it dried enough just from leaving the lid open a bit and mixing it. I also allowed the natural release.Do you think if I try 4 minutes or 5 for the cook time it will turn out just a bit more soft? For softer rice, I would recommend adding 1/4 cup more water and cook it for another 2 minutes. For Pot in Pot what are the time changes for Basmati and for Jasmine rice? Hi — I’m sure you have tried the “Rice” program on the Instant Pot, but your recommendation is to use manual setting for 3 minutes? Can you share why? Thanks! The Rice program cooks at low pressure instead of high. We prefer the texture and fluffiness with the high pressure setting! If I am making a full 8qt pot, 16 rice cups/water would you still only do 3 minutes? Cooking for a large group and don’t want to have trouble. Yes, still only 3 minutes + Natural Release. 16x”ing” the recipe will require some precision so please be mindful about the water and rice ratio. Hi! Thanks for all the work you put into your recipes! I have been looking for a rice recipe for a LONG time. I just wanted to point out that you list under the Golden Rules section 1 cup Jasmine rice as 250g, but everywhere else as 230g. Is it 250 or 230g? Thanks! It is around 230g – 235g for 1 cup of Jasmine rice. Hi there! Do you happen to have instructions for cooking with white sushi rice? We are working on a sushi rice recipe. Sushi rice recipe I followed was too al dente. It’s been a few months – have you figured out the sushi rice yet? We usually use our rice cooker, but I needed rice and I needed it quickly. Perfect Pressure Cooker Rice came to the rescue. It was my first time making rice in the Instant Pot. Within 15 minutes dinner was on the table and everyone was happy. Thank you for saving my dinner. What do mean by natural release for 10 min. I understand the natural release but 10 min, how? The floating valve should drop in roughly 10 minutes. If it doesn’t you can turn the venting knob to the venting position to release the remaining pressure. Question: when you do the natural release do you leave it in the keep warm mode? Leaving it on keep warm mode is fine. How does this hold up if made in advance? It will hold up well. Make sure to remove it from the pot and let it to cool or it will become mushy in the keep warm mode. Warm it back up in a microwave (sprinkle with a dash of cold water) before serving. HI, just got an Instant Pot and am excited to explore the possibilities…one question that, I think crosses over into many other recipes and that is: In making the Jasmine rice, I put the rice and water into the IP and set it for 2 minutes….it takes roughly 10 minutes to heat up to cooking time, then 2 minutes cooking under High Pressure, then roughly 10 minutes with Natural Release….so from start to finish for cooking rice is roughly 23 minutes? When I use my rice Aroma rice cooker, it is about 18 to 20 minutes and if I cook it stove top in a covered pot it takes about 18 minutes….my question is it seems the Instant Pot actually takes longer to cook rice than basic stove top covered in a pan…..Am I missing something here? Thanks, and I do look forward to exploring recipes and love your site and guidance. Thank you. I agree. Cooking rice in the Instant Pot will only save a little time when compared to the stovetop. Instant Pot shines when we cook the main dish and rice together with the pot in pot method. For my rice cooker, it takes roughly 45 minutes – 1 hour for perfectly cooked rice. There is a quick cook setting (15 – 20 minutes), but the rice will have inconsistent texture. As for stovetop, remember to take bringing the water to a boil into calculation. Will chicken broth work in place of the water? My dad used to make pressure cooker chicken and rice for me as a kid. There was nothing like it! I’m thinking I’d cook my chicken and then my rice using the broth. Thoughts? Please see this recipe for reference. As usual, I can depend on your recipes working. I wanted the coconut jasmine rice but lacked the coconut milk so did it plain. Next time with coconut! I just made the jasmine rice in my instant pot and it came out perfect! Thank you so much! Glad you enjoyed the jasmine rice, Men! Glad you had an awesome start with rice! I’m sure you’ll have many more yummy food ahead as you continue to explore the pressure cooking world. Feel free to reach out to us if you come across any questions. Have fun & enjoy! I love brown rice, have you had luck making it in the instant pot? If so please share your recipe. Thank you. I’ve used other IP rice recipes and they’ve turned out great but this one did not work for me. I triple the recipe when I make rice because we eat a lot of it. So I used 3 cups each of water and rice. I followed the cooking instructions exactly: 3 mins of high pressure and 19 mins natural release. The rice on the edges was perfect but in the middle there was quite a bit of uncooked rice. Any clue why it didn’t work? 1) This recipe is designed for long grain rice such as Jasmine rice. If the rice was a different type, it will need a different cooking time. 2) The Instant Pot was not sealed properly. When rice is cooked under pressure and fully submerged in liquid, they should cook (overcook or undercook) evenly. I just tried this method and the rice came out perfect! Thank you! Nice and chewy, not too wet. I was surprised with the 3 minute cook time but it works out well and makes the total cooking time so fast! Pressure cooker for the win! I still have a dedicated rice cooker that I’ve been using but I’m looking forward to trying to cook rice in the Instant Pot soon. I just wanted to check with you, if I put it to high pressure for 3 minutes and then just let it natural release entirely (because I’m away doing something else), is there any danger the rice will over cook and get too dry? Thanks for sharing this recipe and answering everyone’s questions! The rice can get too dry if the keep warm function starts to kick in at around 70C (158F). Hello, am wondering if I can do the same instructions for generic long grain white rice. Thanks. Generic long grain white rice is usually Jasmine rice so it will work! After the cooking time (and during the natural release) do I put the pot on warm or turn off entirely? You can keep it on warm or turn it off entirely as the keep warm function does not kick in well after the natural release. Hi, I see other 5 min IP cook times for rice. Uncle Ben’s time is 5 min simmer. Why won’t pre-cooked rice work in IP? You can technically use the Instant Pot to cook Uncle Ben’s rice with the pot in pot method, but it will be slower than stovetop since boiling water is slower in the IP. Hi thanks for your useful tips. I bought an instant pot last month but never had good results on rice. Rice from instant pot is too dry and too plastic without natural taste. It is not same as ordinary pressure cooker’s rice. This cooker seems to be good at cooking meat or bean but not at rice. I would like to know some tips on cooking rice that holds natural taste. Thank you. You can add about 1/4 cup more water if you think the rice is too dry. As for the plastic without natural taste, we haven’t really experienced it. Could it be the brand of rice? I tried the 1:1 ratio on jasmine rice with the 3 min recommended time and when finished let sit for 5 min which it goes to hold warm – then released a little steam – I think another minute would be necessary to cook or maybe a little more water then rice because was dry and a little undercooked. Or did I do something wrong..? Instead of 3 minutes + 5 minutes release. The cooking time should be 3 minutes + 10 minutes natural release. So it will need another 5 minutes of sitting before the rice is fully cooked. Thank you for another perfect recipe! How large a batch can I do at one time in my 6 qt. IP? Can I do 8 cups dry rice in 1 cooking time? Any adjustments needed for time? THANK YOU!! I think up to 3 quarts (12cups) will be alright. I haven’t tried 8 cups, but you may need 2 extra minutes for such large quantity. I noticed that the measurements for the Jasmine and Basmati rice, both say one cup, but measurments fir each are different, and why is this? Also, for the rice, are you using a glass measuring cup or one such as used for flour/sugar. Love you recipes. Jasmine and Basmati rice have different shapes and sizes so 1 cup of rice will not be the same weight. Both glass measuring cup and flour cup will work, but the most accurate way to measure is to use a kitchen scale. I cannot for the life of me figure out what I’m doing wrong! My jasmine rice comes out not cooked in the middle of the pan and somewhat cooked around the edges. Always gluey. Exactly 1 cup of rice and 1 cup of water. Rice well rinsed. I am following the other instant pot recipes which say 3 or 4 minutes. Last try was manual for 3 mins with natural pressure release for 10 mins. Release remaining pressure and open. I have varied the cooking time 3 – 5 mins, but always keep rice to water ratio the same. Make sure the venting knob is turned to the sealing position. The sealing ring may not be seating properly as well. What about the recipe for sweet sticky rice? If you are referring to sticky rice, we have the recipe here. If you are referring to Thai sweet sticky rice, we don’t have a recipe available yet. I followed this and though my rice came out cooked, it came out a little wet. I followed as instructed, forked it then left it alone to rest for a bit. It’s still slightly wet, but better texture than before. I guess I’m a bit disappointed because the rice comes out way better with my rice cooker. I haven’t used the rice button on the instant pot. Do you know how long the rice cooks for with the preset button? Thanks. 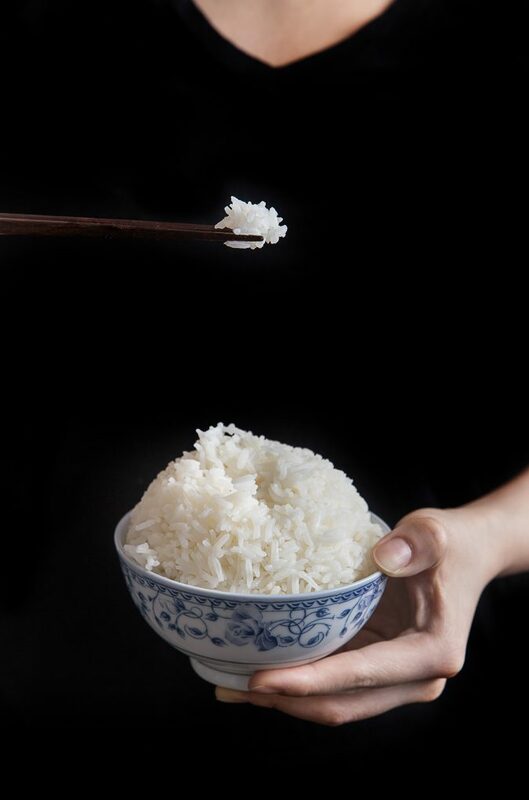 If the rice is too wet, you can reduce the amount of water until it is the perfect consistency for you. The rice button will cook for about 10 – 12 minutes depending how much rice you use. If I did PIP would you still recommend 3 minutes? I was going to make Mongolian beef in the pot and then white rice in a metal pan set on the trivet over the beef. Thanks! I would do 5 minutes + natural release for PIP. I’ve never been able to cook rice…it’s either been too mushy or too hard. Thank you for your past; I just got an instapot for Christmas. I do have one question: do you put the rice in there after you set it or after it is done preheating? And how do you know when it’s done preheating? It doesn’t make any noises. Thank you! No preheating is required to cook rice in the pressure cooker. The rice should be in there before any heating. The best rice I’ve had in ages. Love my rice and have always cooked it in a rice cooker. Lunch today was Jasmine rice and about 1/4 lb of Kielbasa sausage in the IP. Sorry rice cooker. IP wins. I keep finding are for Jasmine Rice, Basmati Rice or Brown Rice that are very consistant, but what about regular long grain rice? I can’t find two that are the same. Do I treat it like one of the above or is there some other secret? Also, I notice most recipes just use a manual setting for the time, but never the Rice setting. Do you know anything about the rice setting on the Instant Pot? Sorry for so many questions, but I’m confused. For now, I’m just using my good old regular rice cooker. Regular long grain rice is usually Jasmine or Basmati Rice. Sorry, I couldn’t get the stars to work last time and it wound up giving only 1. This is a GREAT white rice recipe! I have to say I was skeptical with the 3 minute cook time but this turn out great!!! Thank you! I may have to put my rice cooker into storage now ? could you comment a bit more on quantities to use if you rinse the rice (ie. do you subtract 3 tablespoons of water?). since it is a perfect rice recipe, I’m just curious if you rinsed your jasmine rice before adding the 1 cup of water listed in the recipe. We tried both methods. Yes, subtracting 3 tablespoons (45ml) of water will work if the rice was drained well. The most accurate way is to use a kitchen scale. I just wanted to say I followed this recipe exactly as it was written (including the optional salt) andd it was the best rice I’ve ever made. And I’ve made a lot of rice!! Have Fun Cooking & Hope to see you around! I made the rice with your recipe it came out GREAT!! Everyone loved it. I was wondering how would I make Un-Fried Pork fried Rice with vegetables? As a one pot main dish, I have leftover Cooked Pork that I diced, and raw veg I want to use up. Thank you for helping me out with this meal recipe. What kind of vegetables are you using? I just measure the instant pot cup it holds 180ml water but only 150g jasmine rice on the scale. Is it not the weight but the volume that counts? Weight is a more accurate measurement. I don’t think minute rice will work in the pressure cooker as they are already pre-cooked. Hi! What is the difference between cooking rice with your recipe vs with the Rice button? When would you ever use the Rice button on the IP? I made rice for the first time with the IP today and just pressed the Rice button. I made 3 cups with the 1:1 rice to water ratio. I waited for the NPR and when I opened the pot, the rice was just slightly soft. I may have added slightly too much water. But also I noticed the bottom of the pot had rice stuck all over it. How do I prevent this from happening? The rice button cooks rice at low pressure vs our recipe at high pressure. The rice button is designed for white rice, but cooking on manual at high pressure yields a better result. To avoid the rice from sticking to the bottom, make sure to fluff and remove the rice as soon as it is cooked. I have an Instant Pot and I love it! But I live at 8,000 feet, so I always have to wonder whether what I’m cooking under pressure may need a little more time. Will the times you give here work for cooking rice at a high elevation, like mine? Thanks! How much water and how long for plain white rice? Plain white rice is usually Jasmine rice or Basmati rice. You can follow the two recipes depending which kind you have. Can I use the hot water for cooking rice to speed up the prosses? I would not recommend using hot water. You will be speeding up the go up to pressure process, but you will probably have to add an extra minute to the pressure cooking time. Hi- just wondering if the rice should be 230ml or 250ml… I’m excited to try this! Thank you!! Eve – 230 g = 250 mL (1 cup). Can you use chicken stock instead of water? Yes, using chicken stock in place of water and some salt will boost the flavor! Hi, Living in small city apartment, Instant pot needs to replace my traditional rice cooker in order for it to fit into my life. We always use short grain Kokuho Rose type rice. (almost daily) Will this work? or only long grain rices? thank you for your question. Our readers have tried Kokuho rose type rice in the Instant Pot and it has worked. It will still be a 1:1 ratio 230g Jasmine rice to 250 ml cold running water in the bowl (preferably stainless steel). Pour 1 cup of cold running water into the pressure cooker and on a rack, place the separate rice bowl. Cook at High Pressure for 5 minutes + 10 minutes Natural release. This rice looks so fluffy and delicious. Being gluten free I eat a lot of rice. I’m going to have to try out your tricks! That is some mighty fine looking rice! You’ve reminded me that I was given a pressure cooker last year – it’s still sitting, unopened, in its box in a closet somewhere! I must dig it out and get experimenting! That looks rather perfect! Nothing like good rice! I don’t own a pressure cooker but this recipe might convince me to get one- I always burn my rice!! Yes! You won’t believe how easy & quick it is to make rice in pressure cooker! Can I double or triple the recipe and use the same time/water? You can double and tripe the recipe and use the same cooking time and water. Be sure to not fill the Instant Pot more than half way full as stated in the Instant Pot user manual (page 3). For the 10 minutes of NPR, do you leave it on keep warm, as is the default with the Instant Pot, or do you push the button so that it does not do keep warm at the end? Thanks! Love your recipes. The keep warm mode doesn’t kick in until the temperature drops below 176°F so it will not make a difference. With that said, we usually turn it off as a habit. Do you have any tips on making short grain white rice in the IP? Thank you for your question. We are currently testing the cooking time and water ratio with our short grain sushi rice. Have only had my IP 2 weeks. The first thing I made was Brown Jasmine Rice. Used the PIP method and it was better than any I have made in a rice cooker. Have also made beef & broccoli. It was good. Tonight doing a chuck roast with potatoes, carrots. mushrooms. Smells good. Won’t be ready for an hour or so. That’s awesome to hear! Glad you are putting your new IP to good use and enjoying it. I can’t wait to try this. I made some yesterday and it was too mushy and sticky. We eat a lot of rice in this household so I can’t wait to try this!